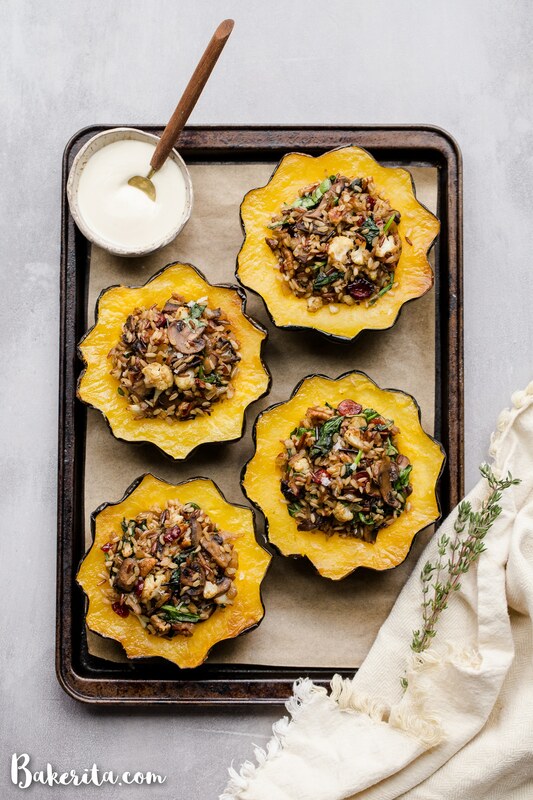 This Mushroom & Wild Rice Stuffed Acorn Squash is filled with caramelized onions, cauliflower florets, spinach, dried cranberries, and pecans. It’s served with a drizzle of lemon tahini sauce. This comforting and colorful dish has a variety of texture, tons of flavor, and makes the perfect hearty dinner or side dish. The first time I made this recipe was in the quaint seaside town of Mendocino, CA. I visited with my dad and my sister this past summer and we stayed in a beautiful house with an amazing kitchen – so naturally, we cooked almost every night (except for necessary meals at Ravens and Wild Fish). My sister and I came up with the idea for this recipe, but we used bell peppers to stuff the delicious filling into. I’m not a huge bell pepper fan, so I ended up eating most of the filling but not eating the pepper itself. BUT I loved the filling so much, I had to make it again. I’ve made it a few times since then, and my FAVORITE vessel by far is acorn squash. I prepped these stuffed acorn squash halves for my family’s Hannukah this year and after getting so many questions after putting them on my stories, I made them again the next day so I could share this killer recipe with you all. 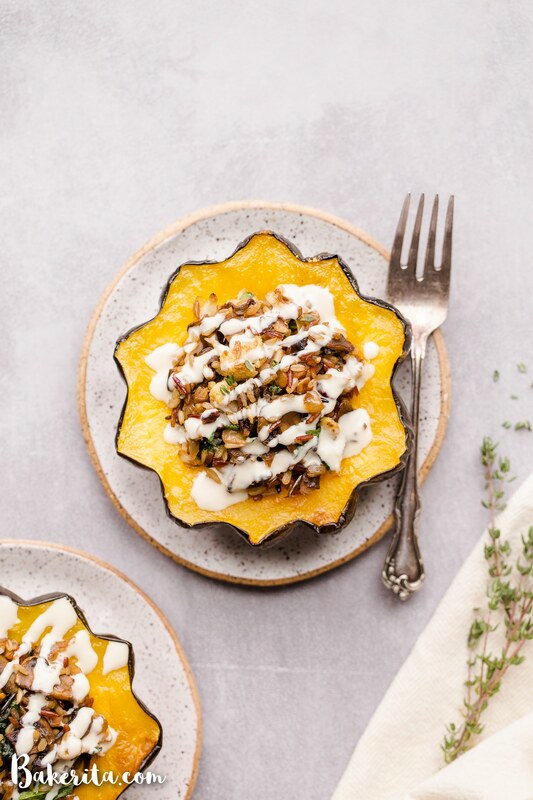 Mushroom & Wild Rice Stuffed Acorn Squash…too good! The recipe isn’t too hard to make and turns out SO flavorful and delicious. 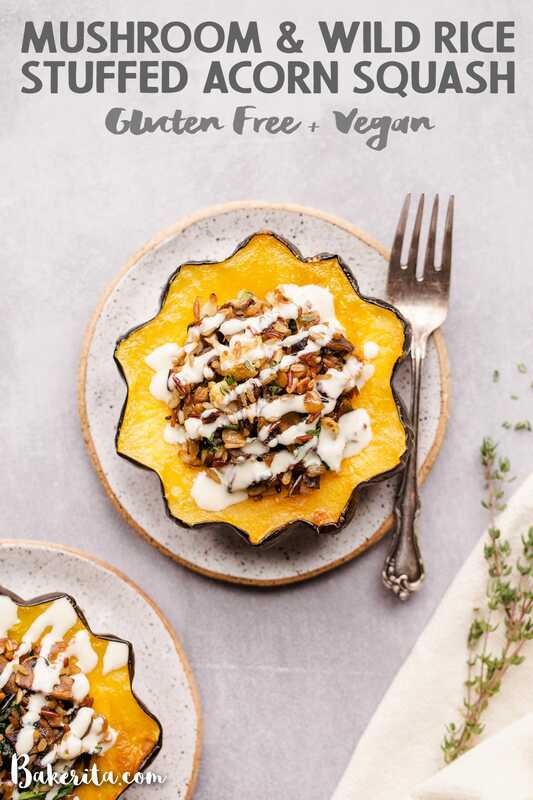 You start by halving 2 acorn squashes (if it’s just you or you and a partner, you can halve the recipe to just make one – but these do make great leftovers!) and roasting them on a baking sheet until soft, about 45 minutes. While the squash is roasting, we make that epic mushroom and wild rice filling. In addition to the mushrooms & wild rice, the filling has sauteed onions, diced cauliflower, dried cranberries, pecans, and spinach. The cranberries add such a delicious burst of sweetness and chewiness. The pecans add crunch, and the spinach adds freshness and a burst of green color. To make life easier, I used wild rice from the freezer section of Whole Foods. I put it in the microwave and tossed it in the pan with all the browned veggies. 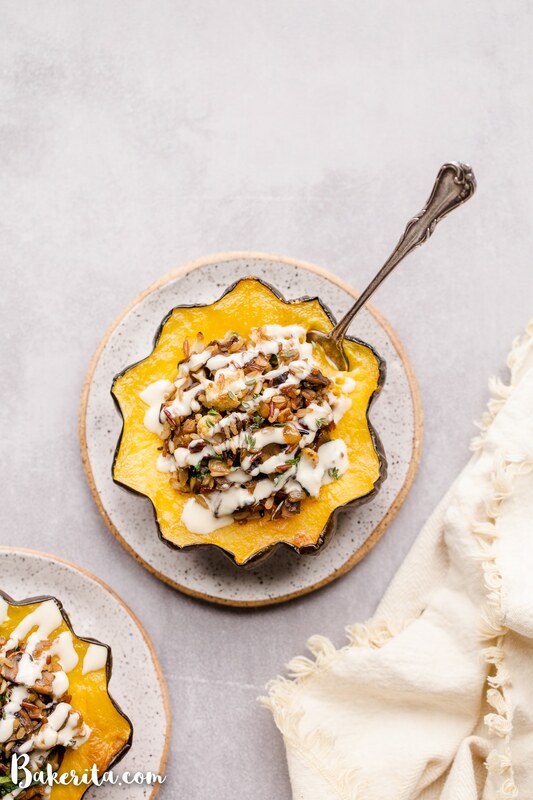 After mixing the filling, we flip the softened squash halves over, fill them with the wild rice and mushroom mixture, and place them back in the oven for 5 to 10 minutes to bring it all together. While they’re finishing up in the oven, time for the SAUCE. I didn’t have the ingredients to make the sauce when I served these on Hannukah. Disgruntled, I told everyone how much better they’d be with the sauce. They assured me it was still SO good without the sauce. Eating it the next day though, after taking these photos, I knew I was right. 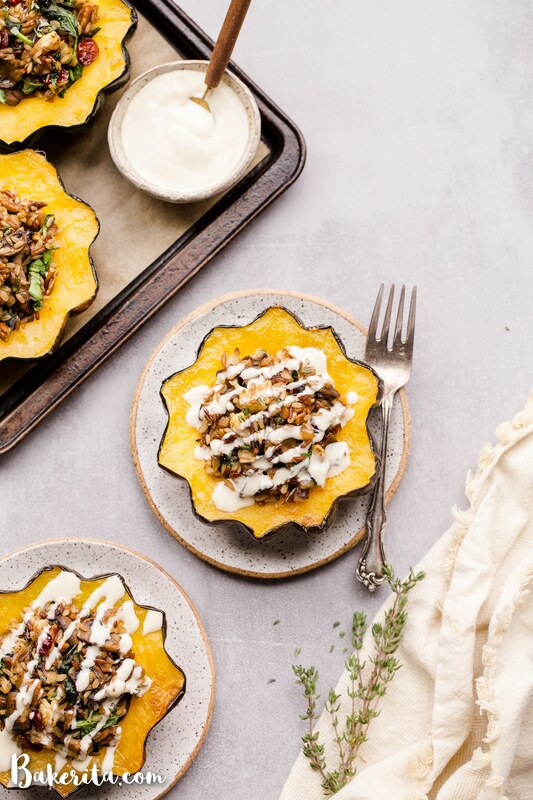 The lemon tahini sauce drizzled all over the stuffed squash halves makes them SO much better. It adds a bright, lemony flavor and complements the earthy flavors of the squash and mushrooms so wonderfully. So – don’t skip the sauce! This Mushroom & Wild Rice Stuffed Acorn Squash is filled with caramelized onions, cauliflower florets, spinach, dried cranberries, and pecans. It's served with a drizzle of lemon tahini sauce. This comforting and colorful dish has a variety of texture, tons of flavor, and makes the perfect hearty dinner or side dish. 2 cups cooked wild rice I used frozen Ancient Grain Mix from Grain Trust - found it at Whole Foods! Preheat the oven to 400ºF. Cut the acorn squash in half and remove the seeds. Brush with 1 teaspoon avocado oil and sprinkle with salt. Place cut-side down on a parchment-lined baking sheet and bake for about 40 minutes, or until the squash is pierced easily with a fork. Meanwhile, make the filling. Heat the oil in a sauté pan over medium heat. Add the onions and cook until translucent, about 5 minutes. Add the minced garlic and cook for one more minute. Remove the onions and place in a bowl; return the pan to the heat. Add the mushrooms and cauliflower to the pan and add some salt to season. Cook until the mushrooms are browned and the cauliflower is tender, 5 to 10 minutes. Add the onions back into the pan. Stir in the wild rice, spinach, pecans and dried cranberries, and stir to wilt the spinach for a minute or two. Taste and season with salt and pepper. 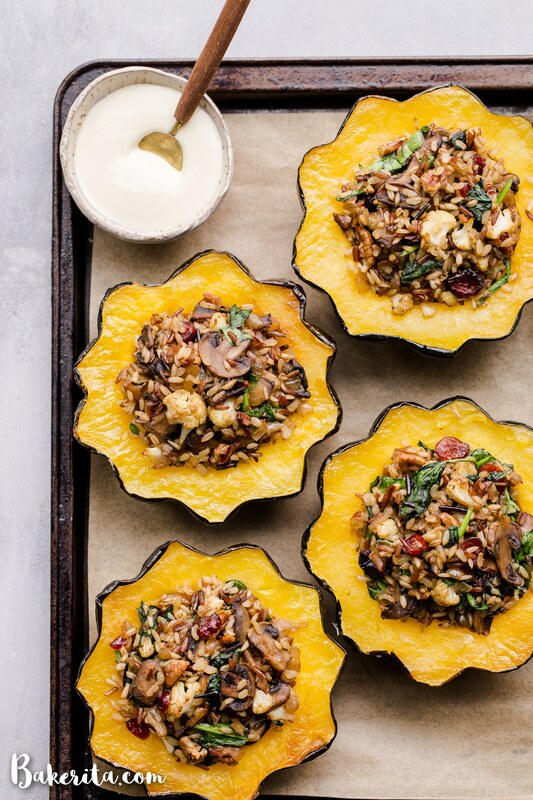 Remove the acorn squash halves from the oven and fill each with the wild rice mixture. You may have some leftover. Return to the oven for 5 minutes to heat through before serving with the lemon tahini sauce. In a small bowl, whisk together all of the ingredients for the tahini sauce, adjusting the amount of water based on how thick you want it. Serve with the stuffed acorn squash. Store any extra sauce in a small jar.